Click on links to purchase or check with your favorite distributor for Phoenix Rising by Cooper Hill. Thanks! The Keiratus nation’s newest hero, Earthian Kate Lightfeather is dying, her systems failing. A mythic legend, the Phoenix, interferes with efforts to save her and draws her to Earth, into a world of danger and adventure, challenging the Keiratus to save not only Earth and all life upon it, but themselves too, from an all consuming threat, the NAWL. 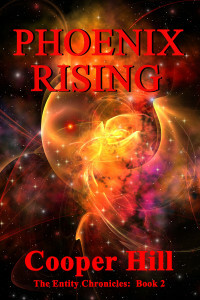 High on an icy Andean plateau, the not-so-mythical Phoenix, a firebird, forces Kate, Srin and Eli, three Keiratus-nation heroes, through a series of deadly tests before it will reveal why it has summoned them to Earth. But they suspect it is to defeat an imminent alien all-consuming malevolent force called the NAWL. To survive, the group must break Keiratus rules of non-interference and enlist the aid of Kate’s old nemesis, an Earth Enforcer named Yohst. Can they solve the NAWL riddle in time? Will they choose to protect the Earth rebels’ fledgling re-entry into space? Or will the NAWL succeed in destroying them all? The Phoenix spread its gold-red wings and breathed in deeply. The power of Earth’s early morning sun warmed and stretched its shining feathers out in wide fans on either side of its body as the Phoenix absorbed the beauty, the strength of this yellow star’s high frequencies. But the life-sustaining rays brought with them vibrational warnings of a universe in peril. Defenses aroused, the fiery bird filtered the message and perceived an imminent danger approaching its domain. It slowly turned a full circle to locate the source, then looked upward to the heavens. Surprised and curious, Earth’s ancient guardian rose into the troposphere. It continued upward–seeking–transfiguring itself to meet the partial vacuum of near-space. As a halo of ruby red mist, the Phoenix re-formed in the upper limits of the ionosphere. It sampled the cold rarefied milieu of ions, electrons and dark matter, troubled by the approach of a violent electrical field disturbance, out of order and out of place. Scanning the inky blackness of the beyond, the scarlet mist flashed repelling energy waves against the encroaching menace, attempting to warn and halt it’s forward progress. But The Unknown continued its collision course with the planet below. Focused completely on thwarting the apparition’s entry into Earth’s realm, the Phoenix sensed the rapacious hunger of the advancing phantom too late. The Unknown veered suddenly away from its planetary trajectory and locked onto the closer scent of the ruby halo’s emanating power. Before the Phoenix could react, the intruder’s ravenous siphon implanted suckers quickly down into the crimson shroud of the firebird and began to evacuate. Feeling itself surrounded and in mortal danger, the ruby cloud spun into a violent vortex and ripped free. Shedding a bleeding comet-trail of iridescent gold-vermillion dust, the Phoenix retreated in wounded rage to the safety and confines of Earth’s gravity. The gruffness in Commander Ariole’s voice belied the affection and respect he felt for this brilliant young Lorind. “Leftenant-Commander, I know you are anxious to complete your mission. We’ve been trapped at the edge of this quadrant for over two decats as it is, and I too am feeling the urgency to action. But your own analysis indicates this thing is still a very present danger. I commend your efforts, I do. Your tests and conclusions have revealed a great deal about the constituent make-up of this Negative Antipodal-Wanton-Leviathan. But we are all agreed that it is as you’ve determined, a Matter-Assimilating Source to which we as yet have no defense, and you, Leftenant, have yet to prove we can confront or combat this NAWL without being ingested by it. Our scanners continue to warn of its enveloping high-density energy field, and if it homes in on your energy trail, an Explorer is not equipped with enough power to escape that thing. If it is indeed the same Unknown the Ona warn of, it is both highly destructive and a threat to all of us with each bit of matter it consumes. My orders are to avoid it at all costs. I have no choice but to deny you access to the quadrant. I will not risk losing you and an explorer with no hope of rescue, or of drawing that beast’s attention to this Command-ship by penetrating the system until we know more. By the by, how did you come to name it the NAWL,” Ariole asked, wanting to distract his Leftenant. Eli sighed inwardly, not in the least bit taken in by his Commander’s redirection, but knowing the fastest way to end the fruitless conversation was to press straight through it. “May I ask, Sir, if you’ve heard further from the Ona,” Eli explored diplomatically, hoping they’d overridden the decision of this stubborn, by-the-book-commander. “Yes, Commander, and they’ve asked me to use my discretion in the matter. The answer is still no,” Ariole replied, not in the least deceived by his ploy. Eli swallowed the frustration and tension unusual in his normally calm center. He acknowledged that it was most likely brought on by the old Guranian’s persistent platform of stasis and not an aberration left over from his recent rejection of the failed Entity-I integration, so he released it, letting it go–for the moment. He saluted hand to heart and returned to his quarters. Leftenant-Commander Eli Harflon paced his small cabin with growing impatience. Bound by dedication to the Keiratus, he could hardly ignore the restrictions placed upon him. But time truly was running out. It was imperative he enter the quadrant within the next few orads, locate the planet Earth in a yellow-star system, and obtain representative bio-tracings of several Earth-humans. Without them, Keiratus bios could not affect biological repairs to the defective and depleted system of the Hub’s newest induction and only Earthian, Kate O’Shaughnessy Lightfeather. The longer he delayed, the greater chance of losing her to death’s abyss. I have to find a way, he thought fiercely. The errant voice of disobedience leapt into his mind–If I’m successful, they might forgive my insurrection. If not, it won’t matter–except as a disgrace my family will bear forever. A deep frown creased his normally taut blue face. He weighed the consequences of failure against the odds of success then threw out the low percentage and thought only of Kate, his responsibility. He’d brought her into this new world of space, enlisting her help to return to his Explorer when he’d been injured on Earth, a planet he’d had no business being on in the first place, and it was his fault she now faced certain death without repair to her bio-system. Decision made, Eli put guilt aside and sat down to formulate a plan, his mind methodically listing the parameters of what he would need and how to go about it. A cora later, he made his way down to the docking bay. “Of course,” Eli nodded. Jrnls released the secure-net and Eli climbed aboard the Explorer. He spent a half-cora transferring the most recently compiled data on the NAWL then side-blinded all internal and external photors. Eli quickly turned the controls to manual, installed a privacy code and readied the ship for departure on the following orad. After double-checking his shunt plans, he imposed a security link on the on-board, then re-united her with the ship’s controls, speaking to her of everyday matters for a few minutes. If anyone become suspicious or questioned her about his activities, he didn’t want Commander Ariole alerted until he was well away. Satisfied he’d done all he could in preparation, Eli left the explorer to resume his shipboard duties. Jhros Ariole stared at the com-screen with a worried frown. Grlys! He couldn’t allow the Lorind to disobey orders. It would ruin the boy’s career, and he showed such promise. Ariole reflected on the orads of his own youth and fierce independence. If faced with the same dilemma, of saving what appeared to be the most important person in the their universe at this time, would he have opted to leave his post without permission? He sighed. Probably. Ariole pressed the com-link and put in a call to security. Kate O’Shaughnessy Lightfeather, the Keiratus’ newly inducted and only Earthian member, let out an ear-splitting scream of distress. Star-ship Commander Srin Urptls’ head snapped up from his study of the wall before him. He responded instantly and completely, plunging through the solid metal verilaqe barrier, forgetting he wasn’t able to transition matter. The tall, solid Guranian’s body erupted through on the other side, head swiveling quickly to assess the danger. His normally soft green feather-scales had automatically hackled into bristling hard emerald armor on the back of his neck. Tiny crystal shards of the verliaqe matrix he’d just transitioned fell from his dark blue uniform, sparkling in the morning sun. As he failed to sense an immediate threat, he demanded, “What is it? What’s wrong,” puzzled to see Kate standing there perfectly calm and unharmed. She didn’t respond for two full rios, her wide blue eyes taking him in, committing every perfect feature of him into the memory of her soul. She didn’t think she’d ever grow accustomed to how magnificent he looked as a Guranian warrior responding to crisis. He studied the abject apology written over her face, until he got to the mischief in those confounded blue eyes. “Holth?” He frowned, not understanding. For orads, Srin had struggled against the verilaqe wall’s unyielding solidity. In spite of repeated attempts at deep-level approach, the half-meter thick barrier had rebuffed him, refusing him entry into its molecular structure. Both his body and his confidence were becoming a bit bruised. Kate and the ebony skinned Yrangian bio, Holth, had resorted to an engineered crisis to draw him beyond old belief systems and into being at one with his new Entity-I integration and matter-based surroundings. Realizing the two had tricked him into success, Srin opened his mouth in a snarl that Kate had since come to recognize as a Guranian grin. Quick as a blink, his long arms snaked out to grab them each about the waist, and tucking one under each arm against his body, he marched around the barrier and down the rich yellow grass-covered hill, humming the Guranian battle song. “Srin, put me down,” Kate laughed, loving the play, the warm summer orad, and the lavender-like smell of the ankle-high grass her beloved strode through as if he were indeed, marching into battle. She twisted, trying to squirm out of his clutches then let out a shriek as she saw where they were headed. “Now Srin, let’s not do anything hasty here,” Holth said nervously, his grey-green eyes turning a vivid green, then growing wide. “Srin, you know I don’t like the water,” his normally low sotto voice pitching half an octave higher. Srin’s captives screamed and laughed their protests as the lake loomed into their tilted view. Without so much as a blink or warning, he took a long running jump into the cool green liquid in dual act of celebration and punishment, and dunked his tormentors repeatedly. His bright emerald-toothed grin told her it wasn’t, and releasing Holth, he leapt suddenly up onto the surface to seize and dunk her again. Feigning terror, Kate wheeled and sprinted across the watery skin like a nimble arnakx, calling back taunts of “You can’t catch me,” between peals of laughter. Unable to run or even walk on water, Holth used the opportunity to escape to shore under more conventional locomotion. Srin raced across the surface after Kate, thinking how easy this was once you overcame the idea of matter in any form being different than yourself. He’d discovered the ability to dance on water only yestorad. Though her weight was slight compared to his, Kate had tripped him off-balance from the swim platform and sent him spiraling down toward an unexpected early-morning bath. On the way to inundation, he’d simply decided he didn’t want to get wet and hit the surface gently, bouncing and skidding across the top as if it were a crumpfa cloud in an amusement park. Small eddies had dispatched in all directions, the water parting just deeply enough to cushion his fall, again simply because he knew it would. Kate had responded with childish delight and raced out to join him. They had spent coras climbing in and out of the water, alternately seeing it in their minds first as solid, then liquid. Occasionally, their concentration would falter and to Holth’s endless amusement one or the other would slip underwater without warning and come up sputtering. From the safety of shore Holth watched his two favorite friends stretching their Entity-I talents into expertise. How the Entity had changed all their lives, he thought. An invisible seeker of knowledge and light, the Entity had chosen to bond with Kate, Srin and their ship’s onboard, Honey, gifting them with a portion of itself. The young Lorind, Eli Harflon had regrettably rejected the first bonding, but had hopes of receiving the gift again. They had first mistaken the Entity as an omnipotent life form, but through integration, discovered it to be only another pattern of humanity; long-lived, advanced, and wise in some ways, naive and lacking in others. Bonding with these physical beings had done much in return for the Entity. An aloof intelligence, it had gained insight into the material plane, a conscious awareness of personal choice and action through active participation. Kate, Srin, Honey, and perhaps even Eli might be the beginning of a new race of Entity-I beings. Pleased with the opportunity to be a part of it all, Holth smiled to himself. “And I’m here to see it happen. At the VERY beginning,” he thought happily. As Kate and Srin stretched out on the water to dry off and have one of their ever-more-frequent ‘private talks’, the Keiratus’ foremost bio turned to watch the sun laying warm red-orange streaks and purple shadows along the horizon of this isolated planet-park near the Hub. Night sounds chittered and whispered the end to another orad. Usually quite happy with his own company, Holth suddenly sighed, an unexpected and uncharacteristic melancholy settling in. A nagging restlessness returned to pervade his mind. What would the Keiratus say when he requested a leave-of-absence? Would they think him ungrateful? Deny the request? Watching Kate and Srin working together in such harmony had spawned a sense of deficiency, an aching loneliness. And more than that, for the first time in his life, Holth felt quite alone. Pondering the difference, he turned and walked up the ramp of the Stla II, left orders with Honey for the agenda of the morrow and, disquieted, entered level 3 to meditate on this unsettling new state of being. “What’s wrong, Kate?” Srin asked, gently stroking the smooth skin of her back. He looked at her quizzically. “Do you not miss anything from your home planet–other than being able to enjoy food, I mean?” He was still curious as to how she had so completely left her entire known ‘planetary universe’ for another and not miss it occasionally. A rare sadness came over her features, clouding those brilliant blue eyes. “It’s an instrument made of wood, metal, stone or fired pottery, an elongated tube with holes in it for the fingers to cover for different notes, and a ‘blow hole’, that when blown across or into, in just the right way, produces notes of the musical scale. “I played for my own pleasure on Earth, and it was the one thing besides apples that I brought with me. Honey had to destroy it to avoid potential pathogen contamination when I was first aboard the Stla II,” she said sadly, experiencing the loss anew. “I see. I’m very sorry,” was all Srin said, but he determined to see if Honey’s memory banks could call up the image and have one fabricated for her. They’d work out the details while Kate was busy with Holth on the morrow. He roared with laughter as he stood, snatched her up and tossed her high into the air, delighting in her squeal of surprise. Catching her neatly in his arms he skated lightly back across the surface of the water to shore. Kate O’Shaughnessy Lightfeather, transplanted-Earthian, Entity-converted-being and blue-eyed-sprite, looked over into the face of Srin-the-wise, warm-blooded reptilian-based, Ona-Guranian, Supreme-Commander and recently converted-Entity-I, and smiled, tickling him under the chin until he opened his sleepy velvet-brown eyes and laughed. The sun shed its first rays of warmth over the heat blanket covering their outstretched bodies and Srin pulled her to him to press a gentle kiss to her forehead. Kate closed her eyes again, feeling lazy. She breathed deeply of the cool scent-laden air, not wanting to move from this perfect spot after another night of exploring the seven Guranian Joys with her intended. Her Entity-I senses could hear the flowers unfolding their petals, reaching for the new orad’s offering of life, and the soft flow of dew trickling down the bright yellow blades of grass, along with a thousand other sounds, sights and smells she discovered she could isolate one by one or allow into her being as a delicious dawn chorus of life itself. If Heaven exists in an actual place rather than as a state of mind, she thought, this must be what it’s like. Life was just–-perfect. She stretched and stood, braiding her hair and securing it into a bun at the nape of her neck with the antique hand-carved Grall tree pick Srin had gifted her with when they were at the Hub. A sudden wave of fatigue overcame her and she had to concentrate to keep the ground from spinning up at her, but hid the disorientation before Srin’s ever-watchful eyes could pick up on it. He would restrict her from the orad’s activities, and she wasn’t about to sit around, letting him have all the fun while Holth poked food and boosters down her. Srin pretended not to have noticed the weakened shimmer of her aura, yawned into a long stretch of his Guranian-giant form, then started the day using the wacky rhyming of the r-f-l 27 she so loved. Kate laughed and reached down to toss him his boots, and they made their way slowly back to the Stla II. Honey interrupted Holth’s daily check of the ship’s systems. “Commander Holth? Kate and the Commander have arrived,” the onboard chimed. Kate frowned automatically, but nodded acquiescence and went aboard to greet Honey and eat as much as she could hold. Holth fretted. He knew she would say yes to please him then push herself to the limit. But her strength and stamina had decreased steadily in spite of his constant attention and ministrations, her body still missing some essential metabolite or sequencing that was foreign to anything he knew or could create. Her diet yet consisted solely of a protein biscuit he’d managed to formulate, supplemental boosters, and an enormous quantity of Entity-derived apples from Honey’s fabricators. “No,” Holth disagreed. “It’s not the expenditure of energy when she’s working, strangely enough. That actually seems to be helping her maintain equilibrium, as her readings are always higher after she’s finished, and she appears to ‘gain’ a small amount of weight while expending energy, which I realize is totally counter-intuitive. I’m not certain if it’s the Entity-I integration trying to aid her, or–I just don’t know, Srin,” he shrugged all four shoulders in frustration, his normally smooth brow furrowed with worry and a bit of anger at himself for not being able to pin this mystery down to a solution. Srin allowed the Yrangian to see the fatigue and worry he kept hidden from Kate, “She’s going down, isn’t she, Holth,” his voice breaking. They joined Kate on board, cleansed and ate while they visited with Honey about some her own new Entity-I parameters. “I can, yes,” Honey replied in continued awe of her new Entity-I self. “I had difficulty turning down the internal volume at first, as did you and Srin, but now, I can sense or hear things kilometers away. I also,” she admitted shyly, “have been working with Commander Holth on ‘transitioning matter’ with the entire ship. He sees no reason why this can’t be done, since every molecule within the ship is Entity-I converted, even though I am the only ‘living’ portion. I am very excited about this possibility. “Oh, yes, Commander, thank you! That would be very good, indeed! I will need a few more days to fully integrate with the concept, but then, I think I will be ready.” Honey lit up her control console with smiley faces and wriggly eyebrows, to show how much she appreciated their consideration and respect for her own Entity-I integration, and sent them on their way laughing. At lake’s edge, Holth set his synchronizer with the pair’s wrist coms and bid them off. He watched with pride as they started the course with an easy sprint across the glassy surface. Sprays of rainbow-colored sparklers leapt up into the sun’s rays each time their feet touched the watery skin. Holth savored the sight, enjoying the peace of the moment and the warmth of the sun soaking into his dark skin. The clear atmospheric breeze brought in multitudinous scents to his elongated sensitive nose and he identified the biological and botanical sources as a mental exercise, adding a few new ones he wanted to verify with Honey. Satisfied Kate and Srin were well on their way, Holth walked back to the Stla II and climbed aboard to monitor their progress over Honey’s com-screen, thinking he could get in an extended exercise period of his own while they were busy, feeling the need to stretch and strengthen his body after the last prolonged space voyage. Srin and Kate had been gone several haplos and were approaching the opposite shore and the woods when a silvery voice trilled an exquisite harmony of five exotic notes just outside and to the rear of the Stla II. “Unable to identify or locate, Commander Holth,” Honey responded, puzzled. “I get a trace of an unknown energy field with a trailer coming in from an outer orbit, but no solid object emission at the source of the sound. Uh-oh, wait a rio, there it is.” The image of a large, fiery, scarlet-gold bird with a bright multi-hued head-crest seemed to materialize out of the air as it filled the screen. The creature pulsed with an iridescent ruby halo, and Holth marveled at the sight of it, entranced by its form and its song. He wondered where this new life form was from originally and when it had been imported into the park for protection or propagation. As the enchanter’s airy refrain lured him out and down the Stla II’s ramp, the bewitching melody floated on the air like a balm, a soothing, healing unguent to a lonely soul. Throwing caution and Keiratus training to the bloras, Holth picked up speed and literally raced to circle the perimeter of the ship. He stopped directly beneath the bird, enthralled at sight of the creature as iridescent deep crimson and gold beams of light shot from its center to cover and envelope him. Overwhelmed by its beauty, Holth became very still, basking in the red thread of energy permeating him, the enchanter’s call painfully-sweet and almost more than he could bear. Honey called after the bio-officer to no avail and watched with concerned agitation as Holth disappeared over the horizon. She was even more disturbed to find she’d simultaneously lost both visual and audio communications with Kate and Srin. Haplos later, the reply to her query from the Hub erupted abruptly over the hyper-channel, but with a static interference in the receiver. There was no response from the Hub, as if all communication lines had been severed. Her internal tension mounting and unable to connect with Kate or Srin through the Entity-I, Honey released the r-f-l’s 36 and 27 from their holding pins and instructed them to seek, locate, and report on whereabouts and conditions of Holth and the marathon team. And the two r-f-l’s swooped down the ramp in opposite directions, two meters above the surface of the green garden-planet.